Syncro Devices have a lot easily accessible options available straight out of the ocean. After clicking on a device's name, you will be taken to the Device Details page, where you can edit the device, view monitoring and antivirus updates, and even run scripts through the section tabs. To get started on all the features available to Syncro Devices, lets break down each section tab for a little more detail. Let's break down each section block to go into even more detail. This is customer information for the device. You can click "View" to open up the customer details page for more information on this customer. You can also click "Customer Online Profile" to view this customer's customer portal, and "Customer Wiki Page" to view this customer's Wiki page (or to a blank Wiki page so you can create one). This is a handy field to leave notes on the device. You can click directly on the note field to open a text field to save any notes you like for the device. Make sure to click "Save" once you are completed to save the note! This section gives a you a quick and easy way to see what is happening on the device. 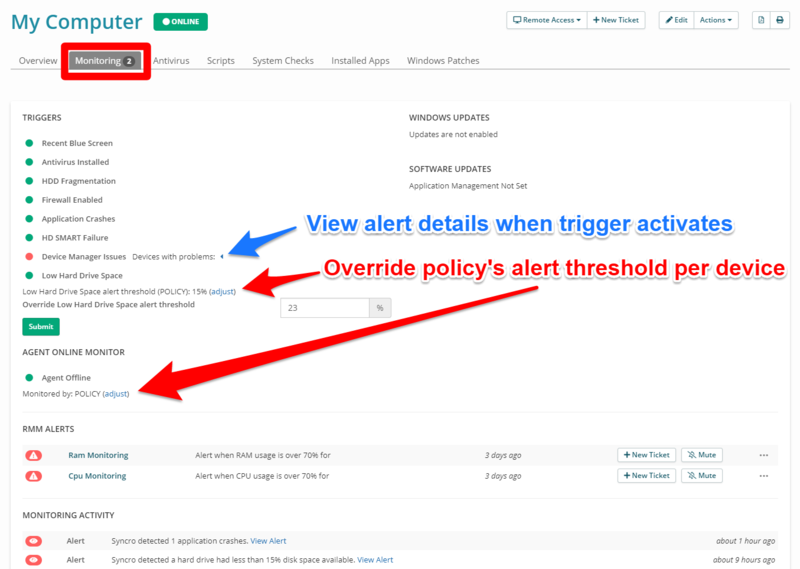 You can view which policy is on the device, along with status updates on monitoring, antivirus, and scripts. You can also select the policy here and change it to another policy on the fly! Recent Activity displays information based on the device's most recent syncs, like monitoring, antivirus, and scripts. Here, you can view all tickets involved with this asset. You can also click on the ticket number to open up the ticket. The monitoring tab can be reached by selecting "Monitoring" when viewing the device. This will show you an in depth look into your monitoring activity, along with your triggers statuses and Windows Updates. Triggers are the conditions that the Syncro Agent checks on the device. Triggers are updated after live as long as the device is online. If a trigger is activated, the green light will turn red, and notify you in "Monitoring Activity". Agent Offline – Alerts you if a device has been offline for X minutes, and alerts you ever Y minutes it stays offline. X and Y are configured on a per policy basis, and can be overridden on a per device basis as well. The Antivirus tab shows the current live status of the device's AV, along with up to date scan log information. Clicking on the scripts tab will let you monitor and manage your scripts for the device. You can create a new script, add a new script to the queue, and view past/pending scripts. To run a script on the device, first select "+ Add to Queue". This will bring up a page to schedule your next script. If that wasn't enough, you can also schedule when to run the script, or run it now. It is up to you! You can add a new check by clicking "+Add Check". This will bring up an edit screen, where you can enter the name of check, which type you would like (Ping or WebServer), the external host address, and schedule how often you would like to be notified. If the host cannot be reached and fails the test, you will get an RMM alert that you can configure in the Notification Center. When the Agent syncs you will see a list of all the installed apps on the computer. We include Name, Vendor, Version and Install Date. Many servers or networks will have ICMP disabled so you cannot ping them. If you want to monitor the status of a webserver in that case, you would want to do a web server check with an HTTP request. Another example would be maybe you want to make sure a NAS on your network is running - but when it crashes, the web interface breaks, but it still responds to pings. Then a webserver check would be a better fit. You could also be monitoring a custom service using HTTP. For example, a custom URL that triggers other checks, etc. If you don't have a specific need for HTTP, just use ping.